It’s finally here! 8th of July 2016 goes down in the history books as the day our first batch of OSSC units arrived. Since we previewed the unit back in March, there have been improvements to the hardware and the software, making this amazing unit even better than it was before. With the final hardware in our hands, we can now review it. While we can’t publish a completely unbiased review since we sell these units in our store, we’ve tried to be as objective as possible. Until now, if you wanted to play retro consoles on your HDTV, you either bought some kind of XRGB or put up with a substandard picture. Sure, there were other more affordable scalers like the ArcadeForge SLG in a box, but while they were often better than connecting your consoles directly to your HDTV, they always fell way short of the picture quality you could expect from a good quality CRT. That’s all changed now with the introduction of the Open Source Scan converter (OSSC for short). Amazingly, the work of one hardware engineer named Markus Hiienkari, the OSSC is causing a huge amount of excitement within the retro gaming communities and rightly so. If you’ve been holding out for the perfect 240p upscaler, this device may just be as close to that goal as is possible. To understand the OSSC and what it offers, let’s have a little lesson on the history of the XRGB series. By now most people are familiar with the XRGB Mini, that magic box that connects between a HDTV and your retro consoles and almost magically makes them look great again, but not everyone’s as familiar with the XRGB3 and previous models. The Mini was something of a departure from the previous XRGB scalers, being designed more like a professional video scaler, similar to the likes of which you may find in high-end home theatre set ups. This approach has a lot of advantages, the incoming image can be scaled to a variety of resolutions, deinterlacing can be done properly, the user can zoom and pan the image and so forth and so on. The predecessor to the Mini was the XRGB3. This device featured a similar, albeit less advanced scaling solution to the Mini, but also had the famous B1 mode. In B1 mode the XRGB3 lost a lot of functionality, but it was able to upscale with no input lag whatsoever. It does this through a process called line doubling. Instead of buffering a whole frame, when converting from 240p to 480p, we can simply double each incoming scanline. By doing this, we get an image that’s nicely scaled, though only to 480p. This is the process that the XRGB1 and 2 used too. However, the old Micomsoft line doublers had compatibility issues with a lot of more recent displays and predictably, offered analogue video output only. A note about deinterlacing – The technique of line-doubling works (with a few minor tweaks) for interlace content too. Indeed, this is how many early deinterlacers worked. This mode is often called “Bob” deinterlacing, since it can make parts of the image bob up and down. In consumer televisions, this technique was quickly abandoned in favour of more advanced and better looking deinterlacing, but for gamers it has one big advantage, zero input lag. Of course, TV manufacturers don’t care about such things and you won’t find this fast deinterlacing on any consumer TVs today. OSSCs lag-free deinterlacing is fantastic for gamers. That said, for interlace games where timing is not critical, you may certainly prefer your TVs deinterlacer to the OSSC. Luckily, the option to simply pass-through interlace content to the TV has now been added to the unit in the latest (beta) firmware and will be available soon for everyone. This means you can now choose the best available deinterlacing for the particular game you’re running. The OSSC takes the concept of the lag free line doubler and brings it into the digital age. Given that most TVs, especially newer sets, scale 480p very well, this is all that is needed to bring retro consoles back to life on modern TVs. The additional features offered by the XRGB Mini are nice, but often not needed, and can be added to the OSSC by combining it with another scaler such as a DVDO/ABT unit, as we discussed here. In later firmware revisions, the option to triple, quadruple and even quintuple the line count has been added, to learn more about that, click here. The first impression you get of the OSSC is how small it is. Arriving in a typical plexi-glass case, like most hobby projects these days, the unit is tiny, measuring approximately 14cm by 7cm by 3cm. It’s perfectly small enough to fit in your bag if you visit friends and want to take some retro consoles. On the downside, there are inputs on each side of the unit, which, if fully populated, can make it difficult to seat neatly next to other gear. Personally, I would have preferred a rack-mountable Hi-Fi style case to fit in with the rest of my equipment, but that would inevitably have bumped the price up quite significantly. Given the open source nature of the project it’s entirely possible we’ll see other versions in different cases too, though the standard case is certainly acceptable. In terms of input and output, we get a VGA/D-Sub15 input, a SCART input and a component video input. Output wise, there’s just a DVI connector. Unlike the preview unit we previously looked at, the 3.5mm audio connector has been moved slightly, so this allows most common audio cables to be connected, without the need to specifically seek out a slimline one. The use of DVI output rather than HDMI has been discussed extensively in other reviews and on forums. The reason for this design choice is simple, cost. Adding HDMI output requires the purchase of an HDMI integrators licence, which costs a minimum of $7,000 dollars a year, completely prohibitive for an affordable hobby project like this. HDMI is nice in that it allows you to carry audio and video over the same cable. If you need to do this with the OSSC, you can purchase a DVI and analogue audio to HDMI integrator, which effectively makes the units output fully HDMI compliant, or hold out for the digital audio upgrade board which we’re looking to offer later in the year. Since the unit was reviewed by Fudoh over on retrogaming.hazard-city.de, the remote has changed a little, since the old small remote is now no longer available from the manufacturer. The new remote and its layout is shown here (click the picture for a bigger view). As has been mentioned in other reviews, there are no on-screen menus or displays with the OSSC. Instead, all settings are adjusted using the LCD on the front of the unit. Unlike the XRGB Mini, there aren’t dozens of settings that need to be tweaked here. While there are some strange sounding advanced options like “H-PLL Pre-Coast”, typically these don’t need to be changed for most sources. Scanline overlays obviously make an appearance, with a range of settings for controlling the intensity of the overlay. Even at the lightest setting, the scanlines will significantly darken the image, so be prepared to notch the screen brightness up just a touch to compensate. For some sources, you will need to adjust the sampling phase, low pass filter and sync low pass filter settings to get the best results. Contrary to Fudoh’s experiences, I found the automatic video low pass filter setting to work very well and rarely had to adjust it at all. For sources that exhibited instability, adjusting the sync low pass filter was usually the best way to eventually eliminate as much instability as possible. There’s also the option to toggle between 480p and VGA 640×480 for 480p sources, allowing you to get perfect aspect ratio on consoles like the Dreamcast, for example. As Fudoh stated in his review, this is the only known RGB/Component to HDMI transcoder that caters for this. Since the OSSC arrived we’ve been testing every machine we could find with it. Every firmware update added better and better performance, resulting in some breathtaking results. Almost all the problems encountered with the earlier firmware revisions are now gone. Let’s see how our consoles performed. Dreamcast – The Dreamcast’s unusual range of signals often causes problems for those of us wanting to integrate the console into our setup. With the OSSC, you can connect the Dreamcast to the SCART input or the VGA input and use both 15khz or 31khz signals without any issues. Theoretically, connecting via SCART should give better results since then you have all the benefits of the low pass filter, though in practise there didn’t seem to be a huge difference. At 31khz the image is perfect as expected. Checking in the 240p suite showed a perfect result with the linearity test, showing that the image was not incorrectly squashed at all. My TV manages to slightly overscan 480p content, but since only a couple of rows of pixels are lost, I’ll take that over a squashed aspect ratio any day. At 15khz the Dreamcast was perfect too, exhibiting a wonderful, stable noise-free image without any need to perform adjustments. Nintendo 64 – Wow, just stunning. 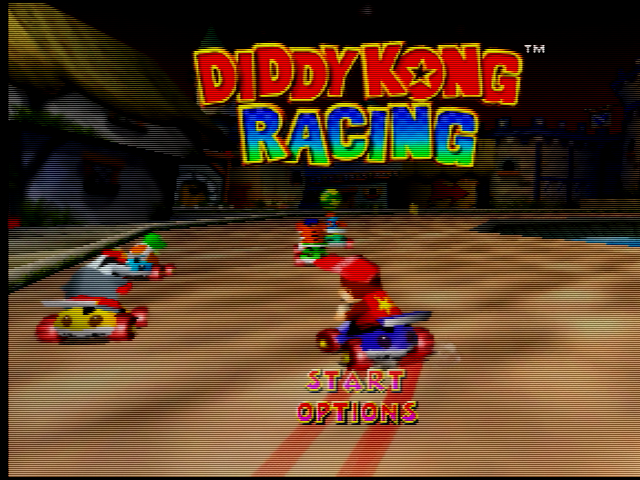 The first time I saw the N64 running through the OSSC I thought I must have accidentally switched to the HDMI mod. This really is the best I’ve ever seen the old analogue N64 look on a fixed resolution display, easily beating the XRGB3 and the Mini this time. I don’t know if this is just because my TVs somewhat dated scaling just happens to fit the N64, or the lack of noise in the image finally brings out detail that’s usually lost, but the results were great and the image was perfectly stable. PC Engine – Well known for causing problems with the XRGB3, the PC Engine (in our case, a SuperGrafx model with the obligatory RGB mod) produced a rock solid, beautiful RGB image with the OSSC, requiring only a manual tweak of the sync low pass filter setting. The aspect ratio on the console seemed a little squashed, but this happens on other scalers too. Of course, on something like a DVDO Edge or the XRGB Mini you can stretch the image out a little, but that kind of functionality is not available here. PlayStation 2 – Another completely flawless performance from the OSSC, no matter what screen mode I threw at it. 240p from the PS2 in Disgaea looked better than I’ve ever seen it, 480i and 480p modes were no problem, even sync on green works. Atari Jaguar – I’ve just had my old Jaguar console modded with a 60hz switch, which makes an appreciable difference to a number of the consoles games. When running the console in 50hz the OSSC has difficulty determining the machines refresh rate and sometimes requires a power cycle or three, or for the user to switch to another source and then back again. When you do eventually get a picture, the quality is excellent, save for a tiny amount of trembling/jitter in the middle. Switch the console to 60hz and everything becomes perfect. Commodore Amiga CD32 with SX32 – People who know me well know that I have a huge fondness for the Amiga line of computers. The CD32 is my current Amiga set up tailored for gaming, with a 4GB compact flash hard drive. First of all it must be said that the image quality with the OSSC was breathtaking. There was less picture noise than the XRGB Mini and compared to the XRGB3 it was night and day. For years I thought my CD32 simply had bad analogue output, but it turns out that the XRGB3 and the Mini simply showed up all the imperfections way more than they should have done. The small amount of jitter or wobble we experienced with the early firmware revisions has gone too, a brilliant result. Sega Saturn – Another near flawless performance on the new hardware. The Saturn looked crisp, bright and free from picture noise. You may need to turn on the sync low pass filter to eliminate or minimise a very tiny amount of picture jitter. For comparison, the XRGB Mini has no picture wobble/jitter but significantly more picture noise in certain colours. Update – All these problems are now fixed in more recent firmware. Sinclair Spectrum +2 – My old Spectrum +2 produced a very wobbly image when connected directly to the OSSC. After running it through a sync cleaner (the old Arcade Force Sync Strike) the image quality was improved significantly. After tweaking the sync low pass filter, the image became excellent, but there was still a very slight wobble that could be detected under close scrutiny. We’re really nit-picking here and overall the image was really stunning, the Spectrum having never looked so crisp on a HDTV outside of an emulator. Furthermore, the Spectrum SCART cable we were using turned out to be unshielded, which could have been responsible for some of the issues. Sega Megadrive – Another beautiful, noise free result. Certain models of Megadrive seem prone to picture wobble/sync instability but it must be noted these models exhibit issues on other scalers too. Again, the effect is VERY minimal on the new firmwares and much less noticeable than the picture noise both the XRGB3 and XRGB Mini add. Those of you who like a little Sonic 2 action will be pleased to know that with a small adjustment to the H-PLL Pre-Coast and H-PLL Post-Coast values, Sonic 2 and any other 480i Megadrive/Genesis games are perfectly playable with the OSSC. SNES/Super Famicom – The SNES/Super Famicom is certainly the system that causes the most issues with the OSSC. On most TVs and every computer monitor we’ve tested so far, the image is great, with no noise whatsoever and just the tiniest hint of jitter if you really get your nose up against the screen. Unfortunately, on some TVs the system simply does not work and it’s impossible to get a stable picture. Various firmware updates have improved the situation but there are still some displays that prove to be incompatible. Commodore 64 – The C64 does not output RGB, so we’re waiting on a transcoder before we can test this one. Of course, the OSSC is great for converting those old analogue/component video consoles into HDMI too. This was covered in detail in Fudoh’s review, so I won’t dwell on it too long here. In our tests with both the Wii and Xbox the transcoding quality was exceptional, without so much as a hint of added noise. The image was also 100% stable, without the slightest hint of jitter. The quality was easily the best we’ve ever seen in a component transcoder. None of the issues of purple tinting or picture drop-out that other transcoders exhibit appeared here, even after several hours of testing. Now that interlace pass-through is available, there really is little reason to bother with any other transcoder in your setup. The XRGB Mini fails badly on a handful of games that change between 240p and 480i while running. Resident Evil 2 on the N64 is one example of this, as the resolution changes each time you go into your inventory. Pinball Illusions on the Amiga is another, as the Amiga’s interlace modes are used when multiball is activated. Transitioning between the two resolutions takes several seconds on the XRGB Mini. During this time you are, of course, completely blind as to what’s going on in the game, which is unlikely to help your chances. The OSSC is able to handle transitions between 240p and 480i much better, though there are some caveats. First of all, contrary to some expectations, there usually is a re-sync required whenever the resolution changes. This is because, on most systems, the refresh rate changes slightly between 240p and 480i output. The good news is that these transitions now leave you with a black screen for around one second, fast enough to be tolerable in a lot more games. The bad news is that this number can go up significantly depending on your display and your HDMI setup in general. In my tests, adding a signal splitter for instance adds at least 2 to 3 seconds. Adding a DVI to HDMI audio integrator may also add to the time. During some more extensive testing we had the OSSC routed and split to two different displays, two scalers and a capture card for testing and comparison. In this rather convoluted setup the transition delay was a game destroying 8 seconds. If fast 240p to 480i transitions are important to you, you need to factor this in when planning on how to setup your OSSC. If you really need to split the output between two devices, then unless you need both active at once you could use an entirely passive DVI switch that’s guaranteed not to need a re-sync. The open source nature of this project means that it’s constantly evolving and new, innovative features are being added all the time. Line triple is one such feature. A world first, rather than simply take in one scanline and output two, line triple mode outputs three instead. This gives a (roughly) 720p image. This is a big advantage for displays or processors where 480p scaling isn’t terribly good. When used on a DVDO video processor, for instance, line triple mode greatly reduces the ringing effect that can be seen at the edge of some upscaled pixels. Unfortunately, line triple mode isn’t compatible with all displays, but for those who can take advantage of it it’s a great little feature. You can read more about it here. Marqs is constantly adding new features. In the latest beta firmware we have here, there’s a new line double mode for 480p sources. While this doesn’t have great compatibility, on displays where it does work it can result in a very sharp scaling of 480p content, all without any added lag of course. In the future, there’s even the possibility of some kinds of pixel filters or shaders. A “De-dither” filter for composite style faux transparencies (e.g the waterfalls on Sonic) has already been suggested and is at least theoretically possible. After all the months of waiting the OSSC is finally here and boy has it been worth the wait. The unit has so many applications for gamers, cabinet builders, system integrators and designers of gaming systems and rooms from the smallest budget to the biggest, grandest project. Its instant upscaling of 240p combined with its flawless transcoding and analogue to digital conversion make it a formidable device not just for gamers but for anyone looking for an easy way to integrate older analogue equipment into their current setup. The lack of support for anything other than Component and RGB will disappoint some, but it’s likely that an add-on device that can convert s-video and composite to RGB will appear in time. What of the XRGB Mini, is the OSSC the new king of retro upscaling? Perhaps, but it must be remembered that the OSSC takes a radically different approach to the problem than the XRGB Mini. For starters, the OSSC can’t output in 1080p natively. With enough patience and tweaking, the XRGB Mini gives a stunning sharp 1080p picture that is generally considered to be the best. The Mini also has no compatibility issues with the SNES on any consumer television that we’re aware of. On the other hand, the OSSC has a frame and a half less input lag, much less picture noise and outputs at full RGB resolution. It lacks the sophisticated deinterlacing of the XRGB Mini, but has its own blisteringly fast deinterlacer instead and is compatible with interlace games on the Megadrive. Pair the OSSC with a DVDO video processor or a TV with excellent 480p scaling and you have yourself an incredible retro gaming setup. Highly recommended! Easily the retro gaming product of the year, if not the decade! There are RGB mods for many of those systems and I’m going to be looking into another transcoder option very soon. We expect a third party to make a transcoder available in the near future too. RGB mods can be expensive and/or difficult to achieve with many consoles (particularly the NES and N64). Not only that, but the benefit of RGB over S-Video on the N64 is questionable at best. I would rather have a scaler that could just take S-Video and upscale it for my TV, rather than hunting down expensive SCART cables and uncommon N64 motherboards. S-Video support would be nice, but SCART cables are quite affordable see http://retrogamingcables.co.uk/. You don’t need an uncommon N64 motherboard to RGB mod it any more, any motherboard can be used with the Tim Worthington mod. RGB is a definite improvement over S-video and when it comes to upscaling you want the best signal possible as every little imperfection is just amplified as you scale. I know that other hardware limitations have already been stated, but would there be a possibility of S-Video being available in a future hardware revision? Since it handles many console video modes so well, it does not seem too far-fetched to include this. My experience with S-Video to VGA converters has been less than ideal, sadly. I already know the OSSC will do well with Amiga computers. It would also be great if I could hook up the Commodore 64 to it. The C64’s S-video is progressive and the converter boxes I’ve used are adding their own lag with some of the conversion they are doing. It would be awesome if the OSSC could take the C64’s ouput natively. Not built into the hardware but we’re hopeful that someone in the community comes up with an affordable transcoding solution. For now the Sony YR transcoders work well with the C64 if you can find one. The Sony transcoders seem to be vintage hardware that is not readily available (at least not in my country). I too hope for a more affordable solution. Why not use a Composite/S-Video to Scart adapter? Will that work? OSSC requires RGB input, a passive adapter will not work it has to be an active transcoder. So lets say if I ever get an S-Video cable for my N64, and I’m too broke to mod it for RGB, should I get the Bandrige powered SCART switcher with its S-Video input or something like that? If I were to be considering this for an N64 or a GameCube, how would this compare to the UltraHDMI mod or the GameCube HDMI mod? If I’m mostly only using those two retro systems on my HDTV, do you think the aforementioned HDMI mods would give better picture than running the consoles through the OSSC via analog cables? And I’m sure for systems that exclusively display pixels rather than vector graphics (i.e. NES and SNES) true digital>digital HDMI mods would be superior to the OSSC? So if I somehow got an Analogue NT, that would no doubt be superior to a NES running through the OSSC? For the GameCube you have to take into consideration that forcing progressive resolutions (480p) is ONLY possible using the digital out port. When you connect your Cube to the OSSC via RGB, only 480i (60Hz) or 576i (50Hz) are possible. As progressive resolutions are vastly superior to anything interlaced (I checked it using Swiss on the Wii via Component Cable) I would highly recommend the HDMI Mod OR the official GC component cable over the OSSC for perfect image quality. That’s the reason I’m skipping the OSSC and waiting for my HDMI Mod for the Cube. For the N64 it might be a different story. That’s correct, if you have the component cables though, OSSC + Gamecube looks great. The N64 HDMI mod has even more advanced features than the Gamecube one, including that incredible de-blur filter. By Analogue NT do you mean the HDMI NES mod? PQ is the same or similar. OSSC has less lag due to its framebuffer free design, HDMI NES has 1080p scaling and other tricks that OSSC doesn’t have. There’s a video on Youtube comparing the Hi-def NES with a Framemeister and discussing some of its advantages and drawbacks. There is no HDMI SNES mod. I’m talking about the Analogue Nt $500 HD NES system. I watched some comparison videos… seems the only real downside with the Nt is that the color isn’t perfect although it does seem pretty good compared to other options. The OSSC would be nice just because you are playing an actual NES with it so the coloring will be as accurate as can be and the picture will look great too. When will we get a price and where can I buy the DIY kit? £150 for the assembled unit, DIY kits are still work in progress. Do you know when these DIY kits will be available so that we are able to put this thing together without having to source additional parts? Well you will always need to source some parts, right now I’m just looking into getting a programmer for the firmware chips. I’m fine sourcing things like cases or cables or other peripherals, but would like to have a kit available that can be put together without having to source ICs or unique components or flashing the firmware. Want to reduce the potential steps where I can go wrong. No plans for a full kit I’m afraid. Given the tiny margins on components, it wouldn’t be economical to the end user if we tried to do this. OK thanks for replying so quickly! Nicely written review but can we have some more details about your N64 hardware? Is it pal or ntsc? what kind of rgb mod does it have? Does it use an amp, and resistors? what kind of sync are you using? csync, clean sync or luma? NTSC unit with RGB amp mod (our own THS7314 board). Standard composite video for sync. Just great! Tested on my Neo Geo MV2F perfect picture and with scanlines on, no difference to a CRT! Just as expected, worth every penny. Compared to my framemeister, there is not much hassle with finding the right setting. Great work from Marqs and Matt! When you say the OSSC has no difference to a CRT , do you mean it also give a “crt blur” effect to the pixels ? The final look depends a lot on the line multiplication mode you choose and your TV. Emulation has plenty of its own drawbacks too. Lots of people really like razor sharp. If it weren’t for the lightgun games I would finally be ready to throw my crt’s out for good. This is going to sound like a REALLY stupid question but it would seem that the only way to get the OSST to work is if you are using scart cables. Sadly I live in the US and we have on Scart connections here (or very very few). Firstly, could some one please tell me if I can make my American Huge LED TV have a Scart connection so that I can truly experience what Y’all Europeans have enjoyed for years. The moment you say yes (hopefully) would someone be kind enough to explain (hopefully) the best place to acquire the parts, and maybe a quick breakdown (I.e. guideline). Luckily I’m pretty proficient with the larger aspects of game consoles. I completely rebuilt an EarthShaker Pinball Machine from top to bottom (imagine over a thousand little pieces on a loveseat over a two week period and going through I can’t remember how many roles of paper towels, thousands of qtips etc etc etc). It looks as good as if it came from the factory. I also own a Neo Geo MVS that looks factory good that I also know in and out as well as my Dr. Pepper machine. I just don’t know and can’t even wrap my mind around this scart thing. The guide (hopefully I’ll get one) would be for my Husband. Yall are all talking about various numbers and measurements and it’s like being dropped on a different planet with non-humanoid creatures that don’t speak English or any Earth language. I though I was fairly intelligent until I started reading Yall’s posts. As far as TV’s go it took me FOREVER to balance the colors on the yolk on my monitor, but it is SO worth it as the monitor has no screen burn. Finding one of those in that condition took forever and cost a lot. Luckily for me my Husband is amazing with stuff like this, but the thing is this is both literally and figuratively foreign to both of us. I REALLY hope it can be done because when I read about your new device last night I came out of my office and my Husband (who never notices anything haha) noticed the expression on my face. He said “Whats wrong, is everything alright?” to which I replied with true awe “I found the Holy Grail Paul. I finally found it!” And then I giggled a little. He is crazy good with soldering. I mean like if he wasn’t a pilot he could do that for a living. So since I don’t want to wait for one to be constructed, I asked if he would do it for me and he said yes (I have deliberately not shown him the photo yet because he has NO idea how involved and intricate it will be Mwahahaha!!!). Really sorry for my very first message being so long. I just wanted to be very thorough. Thank you all in advance for your patience, knowledge and help (hopefully haha). Hi Rose, the input to the OSSC is SCART (as this is the only way to get the best picture from most retro consoles) but the output is DVI/HDMI. You just need to buy RGB SCART cables for your consoles. There are several dealers in the US that sell them or that ship to the US, e.g http://www.retrogamingcables.com/. I reckoned this might be worth posting, even though its something most will not do. I had a large LG plasma TV (LG 50PK550-AA). I learned about hidden service menus, and had wanted to buy a spare main board in case bad stuff happened. By pure accident, I had discovered the same model existed in both Australia and the USA (both were 50PK550). The difference was the letters after the dash. The USA model was 50PK550-UD. Long story short, after researching, I discovered that basically every other critical part about these two TVs were identical (display panel, PSU, TCON, button board). Not only that, but I also discovered several other models that also were in the same scenario. With LG, the 550 is synonymous to features… higher numbers mean better features. The 50PK had models from 250 through 990, and ALL basically had same critical parts. Needless to say, I gave it a fair go and purchased the UK mainboard. It was almost a direct swap. I had to use a dremel to modify the metal back panel… but when it was all done, she worked! The bad: I do NOT know what all makes and models of TVs this is possible on… LG has been pretty good with retaining SCART on their offerings, with even the 2015 4k UHD offerings having one SCART. This is also not for everyone… With the main board change, so too is your tuner, so watching broadcast probably will not work. I’ve been looking into some newer models, mainly as I am wanting to have an LCD version too (since plasma really is only good for games that do NOT have static images, due to screen burn possibility). Did not mean for such a long post, but felt it worth mentioning. As I said, its probably something most will not do… but considering it cost me only about $60, I was quite happy with the PSX and Megadrive performance. I have an Omega Entertainment System for playing Neo Geo MVS games. it comes with SCART and component output. Does this Open Source Scan Converter(OSSC) works well with this console? Does it comes with scanline also? Neo Geo is supported. We’ve had some reports of some MVS machines not working but we’re looking into it. You can add scanlines to anything you like. I just tested the Omega Entertainment System via RGB-Scart, and it’s a no-go with the OSSC fw 0.71. My TV is a Sony KDL-46W905A. I believe the problem is with my TV, because when I route the signal through the Xrgb-mini I get a picture and everything works as it should. Not on this hardware there simply isn’t the bandwidth, who knows in future. Can I suggest a mini or full DisplayPort instead of HDMI? It still can do audio, a converter to HDMI is cheap and readily available, and I believe it’s royalty free. Unrelated to the rest of this review, the 240p/480i resolution swap in Resident Evil 2 N64 only happens with an expansion pak. Switching to the original jumper pak will force it to stay in 240p at all times. Just putting it out there in case someone happens to find this article via google or otherwise. Are all RGB Scarts born equally? For example can I have an RGB Scart on a Snes, N64, Playstation etc? Or does the Console have to support RGB? here in the UK every console came with RF until the PS2 which came with S-Video and we never got RGB… we just went straight to HDMI. So what are my options? The RGB-Mini supports s-video but it also costs £1000 for whatever reason, it used to be £2-300 but I guess they stopped making them and so people are putting the prices up? I just bought a new TV and need something to upscale as my old CRT died and buying a new one is more than it’s worth. Not on an N64 unless you mod it. Ok so basically this thing is worthless to me then, I was planning to get the rgb mini but I dunno what happened with the prices. My raspberry pi 3 emulator works well for the most part though. Worthless because it doesn’t support composite? You can add composite by using a transcoder, but don’t expect great results (either here or on the Mini). Here in the UK we most certainly did get RGB, most of our TVs have supported RGB SCART for decades. Virtually every console on your list (with the exception of the N64 which requires a mod) supports RGB. RGB has always been a thing here in the UK, just because consoles didn’t come with cables doesn’t mean it wasn’t supported. Fore example I bought my PS1 RGB cable from Electronics Boutique (now Game) in town, it wasn’t rare or anything. I believe there is something lost in translation in this conversation. RGB was a thing in UK. I have a PAL Mega Drive with that “A/V Multiout” plug, source for the RGB signal. I think Grant Butler wanted to say “component”, which was only available in the PS2/Gamecube/Xbox era – which are completely different to RGB. If this is the case, then I have a question. Is there a way to plug YPbPr on OSSC? Nevermind. I checked some pictures and saw a model with component input. I drive a THX home cinema with Faroudja VP251 RGBHV BNC Output at 31,5khz. Do you see a way to connect to Samsung TV with 1080p HDMI ? OSSC is not really designed for this you are better off with a different converter. Does it work well the psp and pstv (ps vita tv)? PSP – Works great as a transcoder. PS Vita TV, no real reason to use it with an upscaler. Why doesn’t this thing support composite and s-video? My TV has no problem with 240p/480i/480p component, it’s composite and s-video signals that struggle. The review mentions “certain models” of Mega Drive are prone to picture wobble and sync issues – do you have any info on which ones specifically? I’m thinking of picking one up and it would be good to know ones to avoid. Thanks! No I don’t I’m afraid. I believe mine is a VA4 and that wobbles a little but nothing serious. Any idea if this works well with VC games on the Wii? I have lots of VC games on it. I tried playing some SNES classics on my plasma the other day, but I was just put off by how bad they look. I know the Wii VC can output 288p (activated by a button combination), so that should work, right? Shouldn’t 288p content be line doubled to 576p? Yes that’s correct, it is. Might sound like a silly question but are there settings that allow you to get rid of nasty overscan? Borders that may appear from the left/right/box the image like on Sonic 1 and Golden Axe etc. Yes, you can mask them off, removing that distracting junk pixel thing the Megadrive does and if the TV is compatible you can now use the new line x5 mode that overscans the whole image slightly, eliminating borders in Megadrive games. Quick question regarding Panasonic 3DO. It’s normal output is 480i. Some models can be modded to output 240p but not all. Is 480i converted to 480p through the OSSC or does progressive video need to come natively from the source? I’m here to ask about this as well. I need to upscale SNES and 3DO to any of my HDTVs mostly but my focus is on the 3DO since emulation isn’t good. I have tried several upscalers and have been hugely disappointed. For best results from 3DO through an upscaler, it really needs an RGB mod done and 240p if available. Check out my thread here https://assemblergames.com/threads/3do-rgb-mod-3do-adventures-part-3.67513/#post-956474 for an update on 3DO RGB and 240p. Hi. I just received a newsletter that a 1.6 OSSC is coming in and was thinking I’d really benefit from the 3.5 audio input on that model. I just ordered a 1.5 model which doesn’t have the audio input, and thought could it be possible that there’d be an external board available to be bought separately that would add that input to the existing 1.5 model? Probably not, but I just wanted to ask anyway. And another guestion: I know the OSSC supports RGBHV through VGA, but does it support it through Scart? I’m thinking because I have Sync Strike which outputs RGBHV that I could modify a cable which would take 3.5mm audio and vga and output it into scart to the OSSC, that way I’d get the audio to the OSSC. I have the audio upgrade board coming with it too, so I could then get audio and video through HDMI. I’m just adding that I read from XRGB wiki that OSSC’s audio upgrade board would change the 3.5mm audio output into an input, that would solve what I’m thinking here. Can you say anything about this, is it true? That’s correct, though if you have a SCART cable connected at the same time it can become quiet. The easiest way on 1.5 is to simply feed in the audio to AV1 via a suitable breakout adapter. This can be routed through your SCART/RGB switch if necessary. Audio fed in via the SCART socket will play regardless of what input is selected. The extra audio connector on 1.6 is really for convenience and to save cable clutter. Thanks for clearing that for me. This solves what I was thinking. So I could use VGA or component and route the audio through Scart. Thank you for the info. That’s correct. The only issue with this is some SCART switches don’t detect that there’s a signal if you try to route audio only, but all manual switches are fine. SCART can’t support RGBHV as there’s only one pin for sync unfortunately. Would I need a RGB mod on the n64 to use the OSSC? I want it to look great, but also on a budget here. Yes, RGB is required to use the OSSC. Hi there, i´m planning to adquire one of this but i want to clarify some things before. My use of this device will be with a Sega Saturn (RBG) Playstation 1 and 2 (RGB) and Wii (also GC via Nintendont using Component cable), so, do you recommend to me this device if i want to play and record with this consoles?. All i want is to enjoy my old games on a LCD Tv while recording using a game capture hd II. Thanks a lot. Thanks, i saw that thread but no ones have proved an Avermedia GC HD II. My big deal is with the Wii, because i use componet cables to conect to the Game Capture, so how can i connect this to the OSSC, especially the sound? If you got an e-mail receipt your pre-order was successful. Are there any high quality videos of some of these retro systems running on TVs that we can see the colors and brightness/contrast? That’s the biggest issues I’m finding are these aforementioned things are washed out or just “not right”. I’d like to see it running live if possible. Lastly, what are the average input lag numbers you are seeing? You can fully adjust the colour with the OSSC and it’s sampled in full RGB so there’s no issues there. There is no input lag added by the OSSC (well, maybe a microsecond, certainly nothing you can measure with standard equipment), whatever lag you get is all down to your TV. And one other question I forgot to add. I’m not used to these upscalers. Would they make the games look perfectly clear as if it was a new system all together? Thank you. Like how clear are we talking about? etc. And would the textures look good too? Like the mirror shield in Ocarina of Time and Majora’s Mask, Link’s tunic, No pixilation, for the PS2, N64, Gamecube, etc? Thanks! 🙂 And for example. if I wanted to play my Super Nintendo RGB mod on it. Would it look HD just like the one on the Wii U virtual console? Thank you. ^_^ And would it also upscale my Wii games? Skyward Sword, Twilight Princess, Super Mario Galaxy, etc. Thanks and Have a great day! No, these boxes aren’t able to do that. You’d need to use some kind of emulator to replace textures etc. OSSC can upscale Wii in some instances though it depends on your TV being compatible. Component is supported, a modded and non-modded consoles are supported. OSSC is a line doubler (and tripler/quadrupler etc) not a full blown scaler. Read the review carefully before you decide if it’s right for you. Hello. My LCD TV blinks when I put the Playstation 2 (especially when I play play1 in play 2) on it by video component. If I use OSSC, passing the component video through it will the image stabilize? Not sure what you mean by blink? Do I have to pay VAT for shipping to USA? Also, do I need anything extra if I’m using HDretrovision component cables, I think I saw the OSSC does not have dedicated right-left audio inputs? VAT is applicable to the EU only, outside the EU you’re responsible for any taxes etc applied at the border (usually for the USA there aren’t any). For the HD Retrovision cables you need a 3.5mm to 2xRCA adapter. OSSC is quite a bit different from the FrameMeister, I’d suggest reading the review carefully https://www.videogameperfection.com/2016/07/08/source-converter-verdict/ before you decide if its right for you.